The Maipo volcano is an active, temporarily active stratovolcano of 5,323 meters above sea level, conical in shape, located on the border between Argentina and Chile. The volcano arose in the Pleistocene. There are historical records of, apparently, four eruptions, occurring between 1822 and 1941, which would correspond to strombolian explosions. 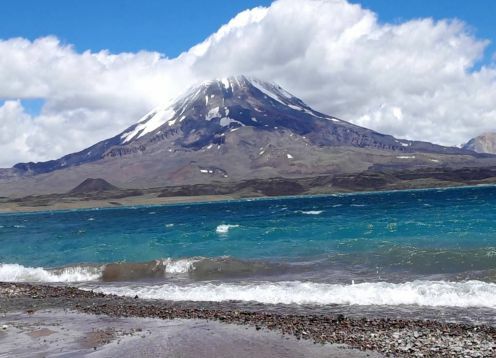 A flow of material, from 1826, would have blocked the path E of draining the melting of the volcano, creating the Diamante lagoon (Argentina). The word Maipo, of Mapuche origin, is very used by these latitudes, at least from the Chilean side of the Cordillera; we use it to refer to many geographical features of the central zone, such as "Maipo river" and "Maipo volcano", the most common; even many labels of known strains mention this word ("del valle del Maipo"); it is called "the cajón del Maipo" to the great geographic fault that contains in its margins many of the most interesting summits of the central zone; of the "cajón del Maipo" its most important urban center is "San José de Maipo"
The Maipo presents the typical form of a volcano; uniformly conical, it presents a wide extinct crater covered with snow and ice. As usual, its southern side is the one that presents the most important and interesting glacier that connects up with the crater. The slope is similar in all its flanks; the north side, as in almost all cases in these latitudes, presents slightly softer slopes, although less snow and more carries. He is so interned in the cordillera, on the border with Argentina, that he is not visible except from an airplane or its closest surroundings.